Do you still have bright, cheery summer colors in your house? If so, it’s past time to move them out and bring in some autumn shades! Dark reds, browns, oranges, and yellows are the colors of autumn, and these warm, earthy tones are exactly what a home needs to fit in with the season. Here are some tips for bringing autumn colors into your house. Select a nice autumn centerpiece. This can be flowers, a cornucopia around Thanksgiving, some pumpkins and other squash, or a selection of autumn colored candles. The table is the focal point of your dining room, and its centerpiece can really set the tone for the room. 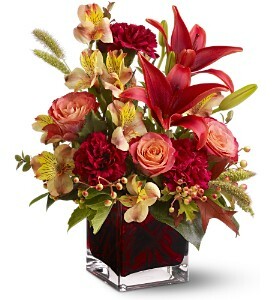 You can also place smaller versions of these centerpieces on your entertainment center or on shelves around the house. Change out your throw pillows and blankets in the living room and other areas. Even though you may have furniture that isn’t done in a fall color (a light blue sofa, for example), you can place brown throw pillows or afghans on it to add fall colors. Just be sure to select a fall color that compliments the furniture (that blue sofa might look odd with yellow pillows, for example). Likewise, you may want to add an autumn-colored bedspread and pillowcases to your bed. While you might not want to completely redecorate your home for each season, this is a good way to bring autumn colors into the bedroom. Like the dining room table, your bed is the focal point of the bedroom, so doing it up in autumn colors is a great way to really change the look of the room. Finally, add a fall wreath to your front door. This will be the first thing visitors see, and it will help set the color tone for your entire house. Of course, there are many other ways of bringing autumn colors into your home. Be creative and you’ll find many neat little ways of bringing these great shades into your house. The holiday season is almost upon us! In fact, some stores are already stocking Christmas decorations! While it might seem a bit early for that, it isn’t too early to get caught up in the holiday rush. Buying gifts, preparing to travel, wrapping up work projects for the year, and the actual hustle and bustle of holiday events can leave us all exhausted and without any time to ourselves. Before the holiday rush starts in, take a little time to stop and smell the flowers. There are several things you can do to prepare yourself for the holidays. While the phrase “stop and smell the flowers” can be taken literally, it doesn’t always have to be. Of course, ordering yourself a nice bouquet of flowers for your desk at work or for your kitchen table is certainly one way of bringing a little peace to your life before it gets chaotic. Another way is to spend a little time outdoors at a local park or flower garden before it gets too cold. Another way to prepare yourself for the holiday rush is to take a weekend for yourself. Relax, read a good book, watch a movie, and generally try to forget your worries. If that’s not really possible, plan an evening to yourself. Order in some food, curl up on the sofa, and maybe even take a nice bubble bath. While relaxing is a great way of preparing for the holidays, some people may want to take a more active approach. For these people, stopping and smelling the flowers means preparing. Make a list of everything that you need to accomplish for the holidays. Who do you need to shop for, what food will you need to cook, and so on. Set deadlines and try to stick with them. Doing this will alleviate a lot of the holiday stress, and that’s the main goal. Don’t have any Halloween plans for this year? Here are some events going on in the Kansas City area that may interest you. Worlds of Fun will be hosting its Halloween Haunts every weekend through the end of October. There are more than 175 acres of Halloween-themed rides and other attractions, including Camp Snoopy’s Magical House. Note that some of the areas aren’t open on Sunday and that some parts of the event are rated for teens 14 and over. The Kansas City Zoo has several different events going on this month, including Boo at the Zoo. This gives families and kids of all ages the chance to visit the Trick-or-Treak Village, take a ride on the Scarecrow Express, or participate in the Jack-o-Latern Walk. All of these are free with your zoo admission. The Coco Key Water Resort offers Cocoween. The indoor water park will turn its 55,000 square feet of fun into a spooky world with crafts, costume contest, and, of course, trick-or-treating. Cocoween isn’t particularly scary, so kids of all ages will have fun. There are a couple of Halloween events going on at KC parks. One is the Enchanted Forest at George Owens Nature Park. It’s a family-friendly event on October 22/23 and October 29/30. Kids will enjoy meeting nursery rhyme, story book, and even comic book characters as they wonder through the forest. You can also take a walk through the beautiful Powell Gardens and check out the many different Jack-O-Lanterns. Their Jack-O-Lantern Walk is a self-guided tour and is free with regular admission. Hosting your own Halloween event? If so, you need some spooky flowers! Village Gardens has everything you need, and there’s still time to order! 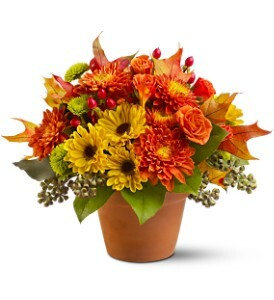 Check out our great selection of Halloween arrangements. Breast cancer is a very serious concern, which is why October has been named national Breast Cancer Awareness Month. A number of different activities take place during October, including the Susan G. Komen Race for the Cure. To help support the many women (and men—breast cancer can also affect men) who are battling breast cancer, Village Gardens is offering a special arrangement. The Miche Hope Bag is a special bag designed by Miche specifically to inspire and bring hope to those who suffer from breast cancer. The bag features many quotes from cancer patients. 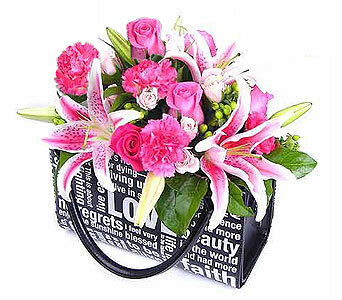 The purse’s shell is black with white lettering, and the purse comes filled with pink roses, pink carnations, Stargazer lilies, light pink spray roses, and hypericum berries. Of course, you can use the shell with any Miche Bag when the flowers have run their course. To help in the fight against breast cancer, Village Gardens will donate a portion of the cost of every Miche Hope Bag to research. Join in the fight by sending a Miche Hope Bag to someone special in your life or even purchase one for yourself. Also remember to support breast cancer research by purchasing items marked with the pink Komen ribbon or by participating in events such as the Race for the Cure. Bosses Day is coming this Saturday, which means most people will celebrate it on Friday. Now’s the time to start figuring out what you and your fellow employees want to do for your boss. It’s also a time when many people stop and reflect on their relationship with their boss. Now may be the time to ask yourself if your boss truly deserves you. There are a few different litmus tests you can apply to answer this question. Does your boss stand up for you and your department? For example, does he or she take the brunt of any criticism instead of allowing higher ups to yell at the employees? How does your boss treat you? This is very important, of course, but you must evaluate it from an unbiased point of view. Your boss may seem to come down on you for mistakes, but that doesn’t necessarily make them a bad boss. If they’re fair and reward good work, then even if they seem to be hard on employees who make large mistakes, they’re still a good boss. Is your boss personable? A good boss will not only interact with employees on work related things but will also get to know them. While it’s true bosses should keep a level of professionalism between themselves and employees, that doesn’t mean they can’t be personable. Good bosses want to get to know their employees and learn about them. So does your boss deserve you? Is he or she fair, personable, and willing to go to bat for you? If you answer yes to these questions, then you’ve got a great boss! If you’re having a wedding this fall, you should already have your colors picked out (otherwise, you may be in a world of trouble!). However, if you’re thinking about a wedding next fall, you have some time to think about what colors you want to go with. Since it’s your special day, you can go with any color you want—no one can tell you you’re wrong. However, there are some traditional fall wedding colors that many people use. Yellow and orange are two of the most obvious fall wedding colors. 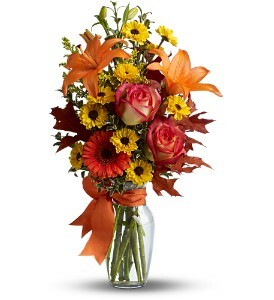 You can make a beautiful bouquet of sunflowers, protea, gerber daisies, and other fall flowers. Yellow can really highlight your bridesmaids’ beautiful complexions, too. Burgundy is another nice fall color. Again, there are many different dark red flowers that bloom in the fall. You can mix burgundy with purple, white, or even a green (although that might make your wedding look a bit like Christmas!). Purple and blue are also two nice fall colors. Blue hydrangea, blue delphinium, and French blue anemonie are gorgeous flowers, as are magenta peony and the rubylight rose. Generally, fall colors are bold and tend towards the darker side of the spectrum, although there’s nothing to say that you can’t use pink, peach, or green in your fall wedding. Just remember to pick colors that compliment each other and your attendants. When it comes to showing people you love them, there are a number of different ways. One of these ways is to send flowers. 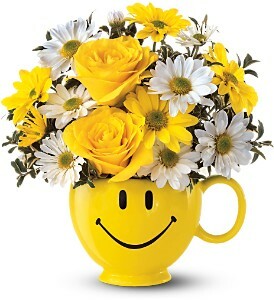 Sending flowers and your love is a great way to remind people just how much you care about them. How does sharing flowers with others share love? Flowers seem to mean more than other gifts. Perhaps it’s because we send them on so many emotional occasions, such as birthdays, anniversaries, deaths, the birth of new babies, and more. 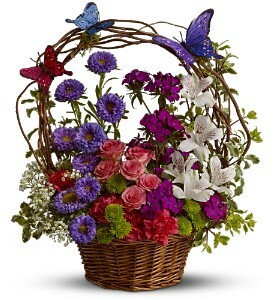 Because sending flowers is so connected to these events, we see flowers as being associated with love and caring. Because of this, when we receive flowers, we feel the love, compassion, and affection of the sender. Next time you send flowers to someone, remember that you’re not just sending an arrangement, you’re sending your love. Make sure your selection and card reflect that. There are many different ways you can make an impression with flowers. Some of them involve buying flowers for yourself, while others involve sending flowers. Here are several ways of using flowers to really show off your personality. 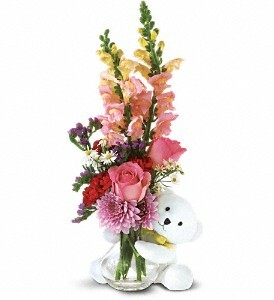 Sending flowers to others obviously makes a huge impression on them. Whether you’re sending the flowers as a birthday gift, a holiday gift, to congratulate them, or for another reason, the person receiving the flowers is sure to be touched by your thoughtfulness. Another way to make an impression with flowers is with your décor. When someone walks into your home, a dazzling arrangement in the entryway can be an excellent way of greeting them. You might also want to place fresh flowers on your dining room table or on your coffee table. They add a splash of color no matter where you place them, and guests will often want to smell their wonderful scents. Decorating with flowers at the office is another way of making an impression. Many offices have a cold, unwelcoming atmosphere to them, especially offices with a rather bland color scheme. Placing a bouquet of flowers in your waiting room or on your desk can help dispel that atmosphere and make your customers feel welcome. This, in turn, will help keep them coming back again and again. As you can see, it’s easy to make an impression with flowers just by placing them in a location where they will be seen. However, be sure that the flowers still look good. You’ll make the wrong impression with a bouquet of wilting, dried out flowers. Your guests and customers will think you’re neglectful of your home or office, and they may wonder what else you neglect. Keep the flowers fresh and you’ll make a great impression. National Grandparents Day is Sunday, September 12, and it’s a great day to show your grandparents a good time in Kansas City. Here are just a few ways you can let your grandparents know just how much you care about them. Many people take their grandparents out to eat. There are many great restaurants in Kansas City, especially in the downtown area. The Crown Center has a variety of places to eat in and around it, plus you can take your grandparents shopping afterwards. The Kansas City Zoo is offering a special for grandparents on Sunday. They will receive free admission all day. Admission for children between 3 and 11 is $8.50, while admission for those age 12 and above is $11.50. It’s a fairly inexpensive activity, and it gets everyone up and outdoors for the day. Have your grandparents over to your house for lunch. How many times do you go to their house for lunch or dinner? If you visit often and they do the cooking, think about reciprocating. Have a cookout or prepare a meal you know they enjoy. Pamper them for the day—don’t let them help with the cooking or the clean up. After you eat, simply sit and visit with them. Often, all our grandparents want is to spend some time with us. Be sure to include your children (their grandchildren) in this, and insist that they turn off the cell phones and video games for the afternoon. But what if your grandparents live in KC and you don’t? While an in-person visit may be too expensive, a phone call or webcam visit costs nothing. If you call, be sure to use a phone that has speaker phone on it so everyone can hear and participate in the conversation. If your grandparents are technologically savvy or have someone who can help them set up a webcam, you can even see each other while you visit. It’s not quite the same as being there in person, but it’s the next best thing.